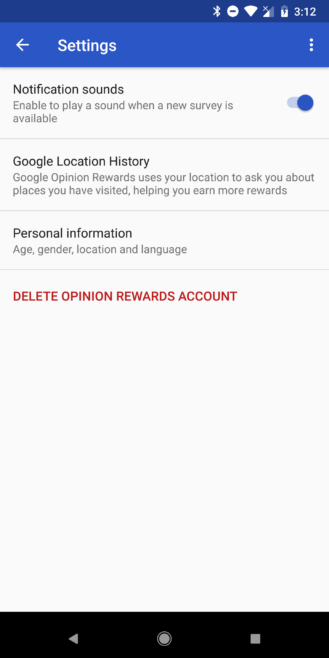 There's not a lot to Google's Opinion Rewards app, but the team behind it spent most of last year expanding its footprint to many new countries. Just last month, it was finally updated to also allow users to make changes to account information they had submitted during the sign-up process, which cleared up some oversights like the possibility of moving to another area. In today's update, Opinion Rewards is closing another gap by adding the ability to delete user accounts. To delete your account, just make sure you're on version 20180516 or newer (linked below), open the settings screen from the navigation drawer, and tap on the link shown in the shot above. There's one confirmation prompt separating you from making your account history. Once deleted, you can create a new account at any time by opening the app and going back through the standard setup process. 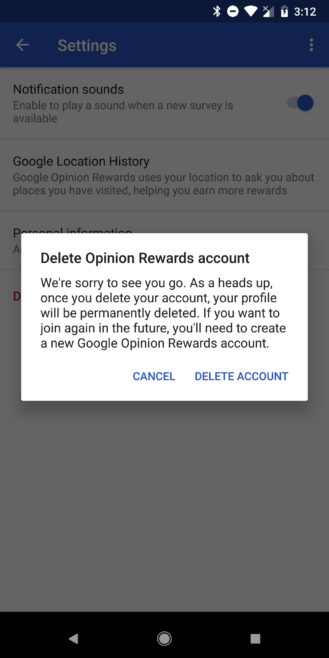 You might be asking why deleting your account matters, and the most likely explanation is that it probably doesn't for the majority of users. We can probably attribute the addition of this feature to the spate of app and service updates in response to the European Union's General Data Protection Regulation (GDPR), sometimes referred to as Cookie Clicker. We did realize there might be another more practical purpose for account deletion: Resetting accounts that seem to be broken. It's a pretty widely recognized problem that many people have stopped receiving surveys. In some cases, users were blocked for giving answers without reading the questions, but even perfectly honest users have complained that they haven't seen surveys in several years. We have no way of knowing if deleting and recreating an account will restore the flow of Google Play credit, but I have tried it and noticed that my reward history is still intact, which leaves me wondering what type of data is stored within the account.